I apologize, which machine ?? if either ?? Yes, IBM patented rectangular holes in 1928 !! Started producing the equipment a few years later. 026 w little box on side in CHM? Subject: 026 and data translator Stan, Ed, Dave et.al. The 026 that we have on display in the Punched Card gallery has a box attached that is a teleprocessing unit of some kind. I'm trying jto identify what it is. So, the question is what is "data translator?" It must be a teleprocessing receiving unit. I cannot find out anything about it on the net. If it was a product, I should be able to find it somewhere. It just looks like an RPQ. It has a somewhat "unfinished" look to it. My guess is that when Poughkeepsie developed the 1001 (then transferred to Endicott), there was no receiving unit in place that was STR (The Transceiver was "start-stop"). So they got Endicott to pout together an RPQ. Can any of you shed any light on what I have found and guessed? Somewhere in the IBM documentation, I saw where a field office would call Poughkeepsie using a dial-up modem and order a computer system by feeding cards into a local reader that would then be punched at the Poughkeepsie end. Each card was an option for the new system. I think the translation was to convert the 12 punches to ASCII and then from ASCII back to the 12 punches of the card. I do the ASCII to 12 punches in the 1401 room now. That is how we punch program cards from the output of the PC version of Autocoder. Maybe this was an internal device for use within IBM. Of all of the IBM 026 keypunches built, I expect that only a small percentage of them have this attachment. Which begs the question of why is a very unique keypunch on display instead of a vanilla 026 like we have in the 1401 room? I think our team can make the unit work on a communication line from a generic CT terminal across the room. That id if anybody else thinks that would be interesting to the visitors. The Radar Picket ships used IBM 026 and 066 machines, plus TTY to transmit track data to the the East and West coast centers. They seemed pretty reliable, except when some one spilled a coke on the 066, rather sticky mess...I am not sure how early they were used as I was aboard from 1962 , (Radar "a" school in June 62.. 26 wks). To decommissioning in July 1965. To acquire the data about the parts to be feed into the 305 some IBM 066/068 Transceivers were installed. The 066 was a modified 026 Keypunch and the 068 was a small electronic unit that held all the pluggable units and power supply- Transceivers could be connected over leased phone lines and a deck of cards placed in the transmitting unit. It would read the cards and send the data one column at a time to the receiving machine. which would punch a duplicate deck of cards at the other end. There was no difference between the transmitting and receiving machine. Holes punched in a card on the program drum determined what the machine did. If you punched an 8 hole in column one of the program card that machine became the transmitter. The 068 had pluggable resonate circuits that controlled the frequency it used. Four different pairs of Transceivers could operate on the same phone line at the same time. There is a picture of a standard IBM 066/068 Transceiver System. The 068 is the electronic box full of single vacuum tube plugable units. There were 12 2D21 Gas Thyratron tubes used to energize the punch magnets and others for things like feed the next card. Each machine has a name plate with the machine type on it. Each system was capable of operating in either send or receive mode. If the card on the program drum had an 8 in column 1 that machine was in send (transmit) mode. There was an octal socket in the top of the 068 that you could plug a small unit into to select 1 of 4 channels you could operate on. Audio tones in different bands were sent down the phone line. 4 systems could operate at the same time independent of direction. If your box does not have a 068 name plate it is probably an RPQ device. Jim, this was the way they ordered equipment when I joined IBM in 1964. The process was to select a machine type and its features from a tub-file (one for each machine being ordered) and then feed the cards one-by-one into a 1001. 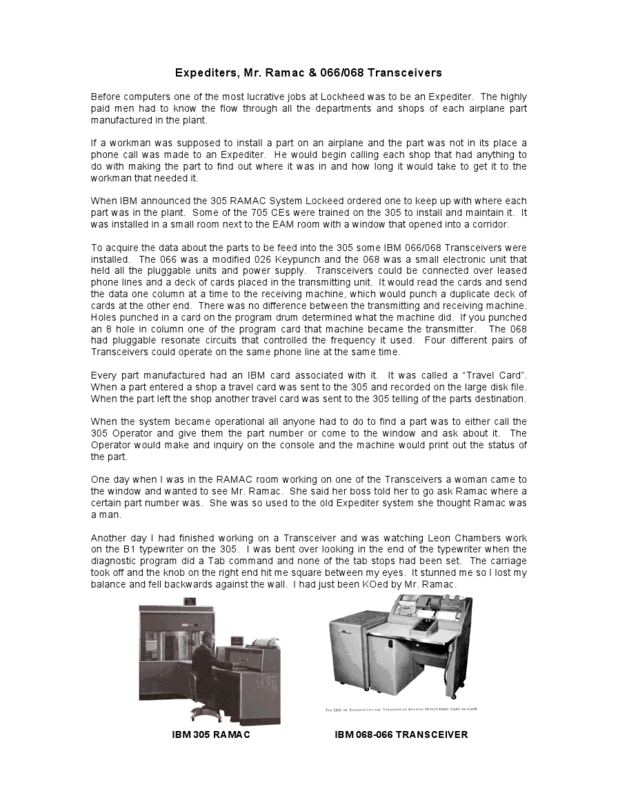 It was a standard machine that IBM sold as well as used internally. The cards were read and then the quantity was entered using the touch-tone keypad on the 1001. As I recall, the transmission used tone mode for the data transmission. Remember that phone connections at that time were analog dial-up, but allowed tones after the connection was made. I don't remember when this process changed -- definitely before I left the branch in 1968. I agree with Stan's comments on the uncommon 026 in R|evolution which definitely looks like the one in your 1001 link [above]. ... My recollection is that there were both transmitting 026s and receiving 026s -- not an offering with both capabilities.